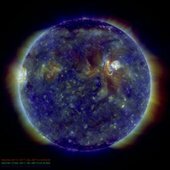 We are continuing the development of the SMAUG, a GPU based code for computational MHD, the code will be used to study wave phenomena in the solar atmosphere. I attended an interesting presentation by Richard Morton reviewing wave phenomena in the Chromosphere. The Chromosphere is a layer in the sun's atmosphere which is about 2000km thick and is situated above the photosphere. The Hydrogen in the Chromosphere is partially ionised, features many flows, waves and is highly dynamical. Through the comparatively transparent Chromosphere we observe granulation in the photosphere and features such as sunspots, pores at higher resolution we can observe the inter-granular brightpoint features. Studies of the Chromosphere are undertaken using spectral analysis of the core of the H-alpha line[Rutten2008]. Magnetic features can be understood using G band studies and the wings of the H alpha line. Leenaarts et al 2012 undertook 3D modelling of the Chromosphere to achieve realistic line formation. Studies of the CaII line have been used to demonstrate that Fibrils may trace magnetic structures in the Chromosphere [de la Cruz Rodríguez 2011]. Other features include the ubiquitous short lived dynamic eruptions observed on the solar limb, known as spicules. There are numerous possibilities for wave mode propagation in the solar environment. An example of a p-mode waveform is shown in the following video, generated using SMAUG, this illustrates the leakage of energy into the solar atmosphere. This energy results from a pressure wave driver in the photosphere. In the case below the driver has a period of 30s and drives the lower boundary of this 2D model with half of a sinusoidal wave form. Further examples of 3D computational models of the leakage of photospheric motions in the solar atmosphere may be found at Fedun2009. The presentation reviewed a range of wave motions with which I am now becoming familiar. Some of these include wave photospheric granular motions inducing horizontal motions or vertical motions inducing p-modes. The work of DeMoortel2012 present observations showing that transverse oscillations are present in a multitude of coronal structures. It has been observed that inclined fields and mode conversion phenomena enable slow modes to propagate to the Corona. Pascoe2012 used computational models to demonstrate mode coupling and the spatial damping of propagating kink waves. As well as transverse oscillations, torsional modes have formed an important area of study. Magnetic elements in the G band have allowed the study of the motion of bright points, Jess2006 have suggested that the swirling motions result in the generation of Alfven waves. WedemeyerBohm et al 2012 have taken this further to illustrate how these magnetic tornadoes channel energy into the solar atmosphere. The generation of the propagation of Alfven waves in spicules has been discussed by De Pontieu2011. Judge2012 consider how typeII Spicules transfer mass and energy to the Corona. Jess2012 compute the chromospheric energy flux of type I spicule oscillations. 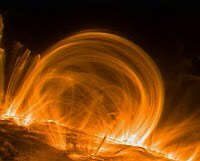 Evidence for Solar chromospheric fibrils tracing the magnetic field de la Cruz Rodríguez2012. A further example is the demonstration of the magnetoacoustic modes in solar coronal structures resulting from the oscillatory motions of umbral dots, Jess2012 achieve this using a combination of numerical modelling and observations. Some interesting results were presented illustrating the transfer of energy into the corona by different wave modes including evidence that Chromospheric waves are excited by photospheric wave motions. A rather curious result demonstrated that increasing energy occurs as a result of decreasing period suggesting that high frequency amplitude waves transfer more energy into the Chromosphere. To understand such behaviour it is important to consider the effects of radiative cooling in the Chromosphere, Leenaarts2011 consider just this issue. The 2D Radiative MHD Simulations of Juan Martinez-Sykora2012 illustrate the Importance of Partial Ionization in the Chromosphere. Increasing resolution will enable fine scale structure studies. There is an abundance of MHD wave motions at all layers, it is a challenge to link the observational, theoretical and numerical models of these modes. What is happening in the interface region of the solar atmosphere? Insight may be achieved through the synthesis of observations and numerical simulations. What are the mechanisms for wave generation? What is the total wave flux? What is the mode of transmission of energy from the Chromosphere to the Corona? Advances in Solar physics have been achieved using a range of earth based and space borne solar telescopes and spectrometers. A promising development is the Interface Region Imaging Spectrograph (or IRIS) which is a planned space probe to observe the Sun by NASA. It is a NASA Small Explorer program mission to investigate the physical conditions of the solar limb, particularly the chromosphere of the Sun. It will provide information on a large region of the corona from 5-20Mm.